Wow! It’s been a while since we posted here. 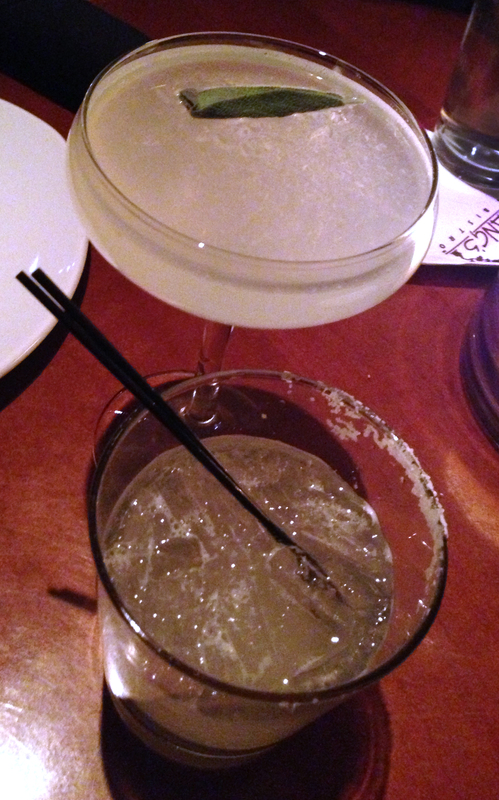 You probably thought that we’d stopped drinking….but we just stopped writing about it. So let’s go back in time just a smidge….Last month, the boyfriend and I celebrated our 2 year anniversary. I let him pick the restaurant (I chose last year, and it didn’t work out so well), and he chose P.F. Chang’s. We’ve noticed that the main dining room is huge and bustling and not at all private, but the bar area provides a much quieter, more intimate setting. Plus, if you are celebrating an occasion, you get a free dessert. I had the Black Tea gimlet, which is a yummy concoction of Absolut Wild Tea Vodka and St-Germain muddled with sage and fresh lime juice. He’s a salted margarita kind of guy. So, in short: P.F. Chang’s bar area for a romantic tryst, delish beverage, and free dessert.